Combine the sugar and water in a pan and simmer till it reaches a 1 string consistency. Combine the flour, arrowroot and melted ghee in a bowl. Add 1 cup of water in a thin stream, whisking continuously taking care to see that an emulsion is formed and the water and ghee do not separate. Add 2 more cups of water again in a thin stream while whisking continuously. At no point should the ghee and water separate. The batter should be of a coating consistency. More water can be added if required to achieve the required consistency. Keep the batter in a cool place away from the heat. Place the ghevar mould in a kadhai and pour melted ghee in it till it reaches 3/4 of the height of the mould. Remove 2 ladles of the batter at a time into a small bowl and place it near the gas range. Heat the ghee on a medium flame and put in one spoonful of the batter into the mould in a thin stream. The batter should settle in the mould. When the froth subsides, pour in another spoonful in the centre in a thin stream. Repeat seven times making a hole in the centre of the ghevar using a wooden skewer stick. Pour the batter into this centre each time. Increase the flame and allow it to cook in the centre by pouring ladlefuls of hot ghee in the centre of the mould 2 or 3 times. When the centre is firm and cooked, pull the ghevar out gently, by inserting a wooden skewer in the centre and pulling it out of the ghee. Immerse in sugar syrup, drain quickly and place on a serving plate. Repeat steps 7 to 13 and use the remaining batter to make 24 ghevars. 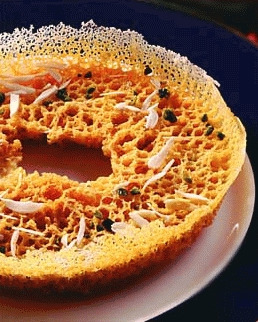 You have to buy special ghevar mould to make this delicacy. You can also use a primus stove ring of size 4 [75mm. (3") in diameter] to obtain 25 ghevars. Alternatively, you can use a large mould to get fewer ghevars in which case the cooking time will increase. You can also top the ghevar with quick rabdi. you are absolutely right latte but sometimes you cannot get the restaurant touch as they are professionals. But on the whole recipe is nice. very nice recipe.though it need lot of time and physical labor but it will definitely impress the eaters.Thanks Ebha and nice name its first time have heard this name.All the best.